John Paul II praised Liberty, Equality and Fraternity at the homily of a Mass celebrated at Le Bourget Airport near Paris on June 1, 1980. 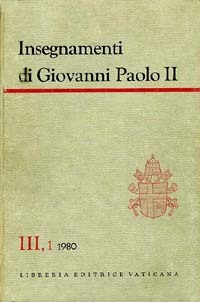 At right, the cover of Insegnamenti di Giovanni Paolo II, below right, a photocopy from the original Italian; below left, our translation of the highlighted text. How much the sons and daugthers of your nation have done for the knowledge of mankind, to express humanity through the formulation of their inalienable rights! The role that the idea of liberty, equality and fraternity plays in your culture is well known. At depth, they are Christian ideas. 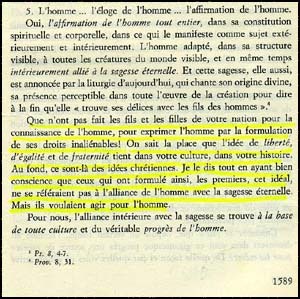 Even as I say this, I am well aware that those who first formulated this ideal were not referring to man's alliance with eternal wisdom. But they wanted to act for the benefit of man.